Conventional electric fences have been around for a long time and remain a very effective means of providing a strong deterrent to criminal ingress. 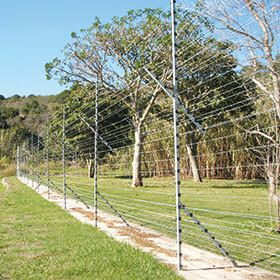 A conventional electric fence uses alternating wires for live and earth potential. A positive pulse is injected onto the live wire at roughly 1 Hz. (one pulse per second). The live wires may be in a series or loop configuration, which can provide immediate notification of a live wire being cut anywhere along the zone or sector. The earth wires are almost always connected in parallel to maintain a good continuous reference voltage for the live wire. Cutting an earth wire will have no effect provided it does not come in contact with another live wire. Some older fences may still have the live wires in parallel too, a carry-over from agricultural fences, or a ‘cheat’ to make the fence appear to be running at full voltage, while masking some poor installation or maintenance shortcomings. As soon as any wires are placed in parallel, one loses the benefit of cut protection monitoring as the electrical path now has several branches to use and simply diverts to another available path. A relatively new concept is to deploy an all-live wire configuration. Here the previously parallel connected earth wires are reconfigured to a second live circuit or loop. Two simultaneous, but oppositely charged pulses are injected onto the two adjacent circuits. A positive pulse onto the old ‘live’ circuit and a negative pulse onto the newly reconfigured earth wire circuit. The net result is a shock if you touch between any two adjacent wires, regardless if you are earthed or not, or a half voltage shock if you are earthed. The net results are: an all-live wire fence, cut protection monitoring on every wire, reduced and equal voltage across all insulators with respect to earth and a fence which is far less vulnerable to manipulation. This concept also works particularly well on wall-top installations where an assailant will not necessarily be in contact with earth while attempting to challenge a fence. The new SANS regulation requirement of regular earth spikes takes care of providing a continuous reference voltage around the perimeter. Elf Rentals started converting some of its premier clients to the all-live wire fence configuration in 2015 to afford these residential estates a new and improved level of protection. The result has been a transformation of what were high-maintenance sites to very stable and very secure perimeter fences, where both client and service provider are reaping the rewards.